Luxury Military Move? Yes, It’s Possible! The world of real estate is not complete without recognizing the HGTV factor. The channel has revolutionized how home buyers, sellers, and renters conduct their searches and improvements. Arguably one of the most popular shows, The Property Brothers details the home buying process with the added dimension of chronicling the purchaser’s renovations. Meet Northern Virginia’s answer to Jonathan and Drew Scott: Karen Hall and her @home real estate lounge & design center. Karen's company is a traditional brokerage with an emphasis on residential real estate, luxury home marketing, and military relocations in Maryland, Virginia and Washington, DC. The twist, however, is @home has within its own walls a Design Center with partner FA Design Build. 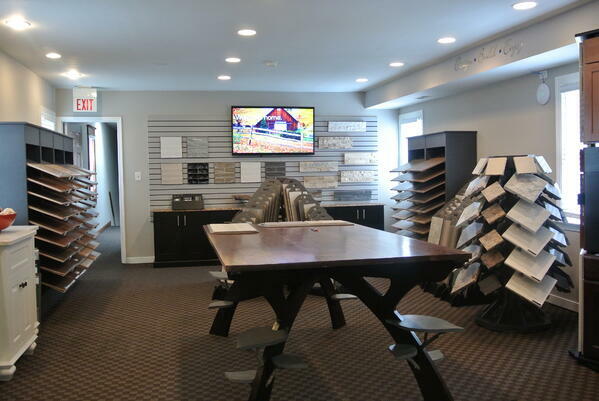 The Design Center showcases samples of granite, flooring and other high end finish options. Clients can immediately envision space changes and needed upgrades with professional renderings provided by FA. This unique partnership allows clients to select a home and obtain a Home Remodeling Cost Estimate detailing exact pricing for improvements before making an opening offer, avoiding over or under bidding scenarios. Sellers benefit from upfront knowledge of what updates and repairs will earn the most from the sale or rental. Before starting the business with her former military husband, Karen realized clients were able to find just about any information they needed about housing markets online. What they were lacking was a customized customer service experience, which is especially deficient in military relocations. Military moves are notoriously unpredictable and ripe for the attention to detail scrutiny that @home provides. It isn’t a surprise to hear more than half of Karen’s clients are military members. Only someone with a background in acronyms such as PCS, LES, and BAH can truly navigate the transitional nuances military families endure. @home was intentionally opened near a boutique hotel in Alexandria, Virginia, for customer’s convenience while processing a move. Easy access to house hunting technology and agents across the street at the office encourages successful client/agent relationships. Entering @home’s space feels like walking into a friend’s house, with lounge seating at every reach and fireplace in view. Although located in Old Town section of the city, the recently renovated building is decidedly modern with computer bars at the ready for home and design searches. The kitchen and bathroom areas are decorated to showcase finishes while the kitchen offers relaxation while enjoying a cup of coffee or snack while chatting with @home agents. Armed with years of real estate experience, this military spouse is set to revolutionize how the home buying and selling business is conducted. With personal service paramount, her real estate lounge and design center capitalizes on the desires of customers to be as involved or as uninvolved as they want to be in the home buying/selling and renovation process; clients are free to peruse new granite counter tops, or they can hand the keys to Karen and ask to be informed when the process is all over. What a convenience to have if an unexpected deployment changes carefully laid plans! The concept of a brokerage with an in-house design component is an attractive option to traditional real estate agencies and FSBOs. Military transitions require flexibility and often juggle unusual circumstances. 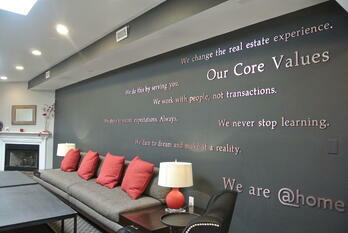 The @home real estate lounge and design center seems to fit those needs easily.